I don’t always post everything I write here, so I thought I’d just share a link to some of my recent science writing. Most of these are things I wanted to make sure I understood well enough to explain them clearly to a class of 13 and 14 year olds. Kids in Britain don’t play outside so much these days. Where our parents were left to roam at will, and their parents wandered much further still, the children of the early twenty-first century are mostly kept indoors. It isn’t safe to go out – the traffic is dreadful, kids have terrible accidents, everyone knows that the streets are packed with paedophiles and murderers. Nobody knows their neighbours well enough to be sure they won’t eat their kids if they get half a chance. What would kids do outdoors, anyway, even if they make it that far? Why would they want to play in the grass and shrubs, up and under the trees, when they can stay at home and spend their time playing on computers and smartphones? This is a problem, if you believe that humans need time with nature to stay sane and physically healthy – and I think the evidence is strong. This is why David Bond appointed himself Marketing Director for nature, and made this film, Project Wild Thing. Marketing nature might be a faintly obnoxious concept, but it’s not hard to see where he’s coming from. The outside world, with its bugs and its plants and its dirt, has to compete for the attention of our children (and adults) against a vast array of highly profitable, heavily advertised consumer goods and activities. What chance does it have? Bond, the director and star of the film, talks to a range of marketing and branding consultants to brainstorm and market-test ideas on how to ‘sell’ nature to a generation that sometimes seems to have trouble seeing the point of it, and to parents who might think it’s a nice idea, but worry about the dangers of letting their children go wild. The conceit works, as something to hang a film off, and helps to generate some solid practical ideas, but it also underlies its main problems – the film is heavily dominated by upper-middle-class white men, often talking about branding. This is bound to make some viewers wince, understandably, and it’s not clear that it helps that many of the kids he talks to are brown-skinned and often female. He also talks to a number of conservationists, naturalists and activists, including wildlife presenter Chris Packham and Jay Griffiths, the author of ‘Kith‘, as well as my brother Leo, who talks about outdoors play non-profit Monkey-Do. All make very good points about human nature and our relationships with risk, play and the outdoors, feeding into the strategies suggested for getting kids playing outside. The film is informative, infuriating and really very entertaining, but I am glad to say it is just one result of the whole process. They also put together a simple, nicely designed app for smartphones, ‘WildTime‘, designed to provide a wealth of ideas about how to engage with the natural world, for anyone for whom it doesn’t seem obvious (and for many children, itisn’t obvious until they actually get out there). Perhaps most importantly, The Wild Network is a growing group of organisations concerned with connecting kids with nature, including the RSPB, the National Trust, the NHS Sustainable Development Unit and hundreds of others. Perhaps these trends can be reversed yet, both in Britain and around the world, but it’s going to take a lot of work yet. I started listening to podcasts regularly some time early this year, when I finally got round to installing software for it on my phone (Podkicker). I’d previously been a regular BBC Radio 4 listener at various times in my life, and started pulling together the Everything2 podcast a few years ago, but it was only with dedicated software that I got into the habit of listening to spoken-word recordings on public transport, as well as while doing the washing up or going to sleep. After a little while of this, I realised that I was listening to a huge amount of very interesting stuff, but without keeping any record I couldn’t be sure how much of it I was really taking in. That’s when I started the OolongListens twitter account – to keep a record of my own listening, to help cement what I learn by keeping notes, and to share what I listen to with anyone interested. Perhaps you will enjoy it. Most of what I listen to is factual programming, often with a scientific or otherwise educational bent, and most of it turns out to be from the BBC, but there’s quite a lot from other broadcasters and private podcasters too. Ionic bonding is the type of chemical bonding that binds non-metals with metals, and occasionally other things*, forming ionic compounds. An ion is just an atom (or sometimes a molecule) with an overall electric charge – many atoms and molecules have exactly as many electrons as they have protons, so the charges cancel out; when that doesn’t hold true, we end up with ions. Metals are prone to losing electrons from their outside shell, leaving them with a positive charge; non-metals often pick up additional electrons from somewhere, filling up their outside shell and leaving them with a negative charge. Opposite charges attract, so electric forces tend to cause these positive and negative ions to stick together. Since those forces radiate out in all directions, you don’t just get one positive ion (or cation) bonding with one negative ion (or anion) – any more ions that happen by get pulled in, too. There’s always a sweet spot where the pushing and pulling of the ions balances out, allowing new ions to slot neatly into any existing structure. That neatness gives a very regular lattice-like pattern to the solid – in other words, ionic compounds form crystals. 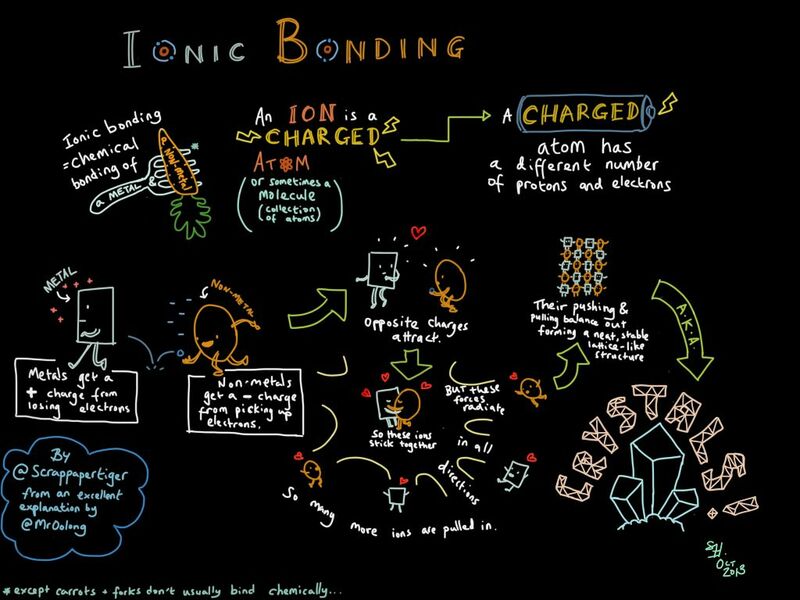 It’s worth saying something about some common misconceptions about ionic bonding. If you have learned about it before, you may have been told that an ionic bond is what you get when a metal ion donates an electron to a non-metal. This description has a pleasing simplicity to it, but it is really very misleading. 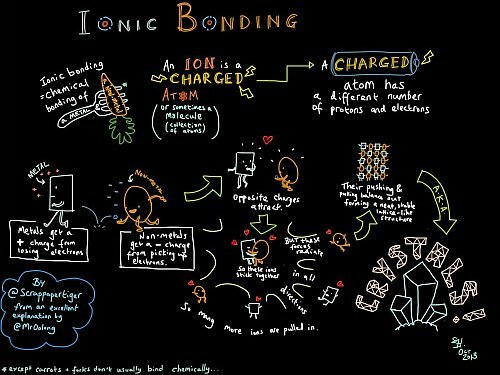 For one thing, ionic bonding typically holds together many atoms at once. This is in contrast to the covalent bonds** that hold non-metals together, where the bonding is down to each atom sharing electrons with its neighbours, which leads to the formation of well-defined molecules. Ionic compounds are not really made of molecules at all, just big crystalline structures. The other thing wrong with the electron-donation picture is that the ions have usually gained or lost electrons long before they ever meet – for many elements, like sodium and the other alkali metals, it is rare to find them any other way on Earth. Less reactive metals may have been exposed to ionising radiation, or lost an electron or two in a collision. Reactive non-metals have a tendency to pick up any free electrons they bump into, whatever the source, because they fit nicely into the geometry of their outside shells. Ionic compounds are characteristically hard, usually with high melting points, and very brittle. The hardness and high melting points are down to their crystal structure; as long as the lattice holds, they are solid and quite strongly bonded. However, since the crystal is made of alternating positive and negative ions, a knock that causes one layer to get out of alignment with the next will often lead to cations lining up with cations, and anions with anions, producing a repulsive force that tears the crystal apart – hence the brittleness. Metals, which also have a crystalline structure, don’t suffer from this problem, which is why they are much more malleable. Many ionic compounds are soluble in water. This is because water molecules are polar, in the sense that they have more positive charge on one side than the other. A negative ion will attract the positive ends of water molecules, and when it collects enough water molecules that way, their collective attraction can overcome its bonding with its ionic neighbours and carry the ion away. The positive ions dissolve much the same way. All these positive and negative ions allow a solution, to conduct electricity – distilled water is actually an electrical insulator, whereas salt water conducts extremely well. Molten salts and other ionic liquids conduct in the same way. There is a useful complication to the way ions in a liquid conduct electricity – because the charge is carried by two kinds of ions travelling through space, not just free-floating electrons like you get in a metal, they tend to separate over time – cations are attracted to cathodes, and anions to anodes. This process, known as electrolysis, makes it possible to extract the constituent elements of a salt; sodium, potassium, calcium and various other elements were first isolated in this way. * Sometimes polyatomic cations, like ammonium, can play the part usually played by metal atoms. **We should note here that there is not really a sharp distinction between covalent and ionic bonds. Many covalent bonds are polar, meaning that the electrons are shared unevenly between the atoms, so that one of the atoms acquires a positive charge, and the other a negative one – these bonds can be considered to be a bit ionic. Similarly, ionic bonds can be considered mildly covalent when electrons get shared between atoms, which they inevitably do. Metallic bonding is sometimes considered a form of covalent bonding, but sometimes not – the shared electrons are more like a sea than a set of pairs. Chemistry gets pretty messy when you look close enough. 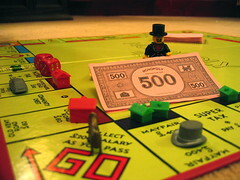 This piece also appears on Everything2. Light, like all the basic constituents of our universe, seems to be made of waves. Waves that act a bit like particles, sometimes, but which spread out and interfere with each other just like other waves. It’s about 200 years since physicists finally agreed that light behaves like a wave, after Poisson proved himself wrong with an ingenious experiment involving a surprising bright spot in the shadow of a disc. We could have come to that conclusion much sooner, if we had known what we were looking for, but nobody really thought about interference patterns very much in those days. Those dark rings are where the light waves coming from one part of the hole interfere destructively with those coming from the other side – the peaks of one meet the troughs of the other. The bright areas are where the peaks meet and combine. Grimaldi didn’t quite figure all of that out, although he did come to something like a wave theory of light. Hooke and Huygens both worked on mathematical theories of light waves around that time too, but Newton published a theory of optics based on light consisting of particles (or ‘corpuscles’). It more or less worked, and given the towering nature of Newton’s scientific achievements, it isn’t surprising that people just sort of went along with that until the early 19th century, when it was conclusively disproved. Once we realise that light is wavy, it becomes possible to explain quite a few observations which are otherwise a bit mysterious. Here are some of the things you might have noticed in your life, which are all inexplicable if you don’t know that light is made of waves which can interfere with each other. 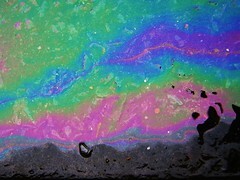 The colours that we see when oil floats on the surface of water come about because the film is thin enough, and close enough to a constant depth, that light reflected from the bottom interferes with light reflected from the top. Since different colours have different wavelengths, they interfere to different degrees depending on tiny variations in the thickness of the film, and the angle of the light. A related effect explains the iridescence of certain beetles and butterflies. 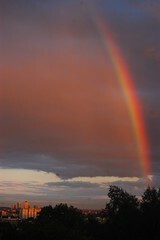 Rainbows, and even double rainbows, can be explained by simple refraction – the light changing speed and direction as it passes through a medium, in this case water. That itself doesn’t prove that light isn’t a particle, but some rainbows have additional, narrower bands of colour inside the main bow – and those are entirely puzzling until you understand that they are caused by interference. The explanation is in the diffraction of light bouncing from fine raindrops, which creates a series of increasingly faint inner rings. The smaller the droplets, the bigger the spacing is between the rings, which is the general rule in all kinds of diffraction. This means that unless they are all much the same size, the effect gets smeared out with different rings overlapping, and we don’t see the supernumerary bows at all. When the moon shines through thin clouds, or a layer of fog, there is often a bright area around it, fringed by bands of colour. 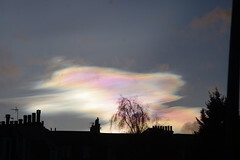 Again, this only happens when the droplets of the cloud are particularly consistent in size – if the size varies from one part of the cloud to another we get a patchwork of colours referred to as iridescent clouds. With sunlight these effects tend to happen where the light is too bright to make out the colours, while with the moon, the light is too faint for our colour vision to work at full capacity. The best way to see these beautiful effects in their full glory is to wear sunglasses, and look at the thin clouds around the sun while blocking the sun itself from your view. 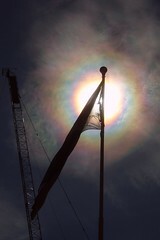 Far rarer than the corona and a good deal more spectacular, nacreous clouds are also the result of diffraction. The difference is that rather than droplets of liquid water, the light of nacreous clouds are diffracted through stratospheric ice crystals. Usually the stratosphere is too dry to form clouds at all, and not quite cold enough, but when it drops below about 85°C, and especially when moist air is lifted up from the troposphere by gales down below, great wave-shaped clouds of fine ice crystals can form, with amazing colours that are often at their most vivid just before dawn and just after dusk. Speaking of glory, if you ever get to look down at your shadow (or your aeroplane’s shadow) in mist or clouds of the right consistency, you will see something called a glory, which looks very much like a corona surrounding your shadow in the mist. 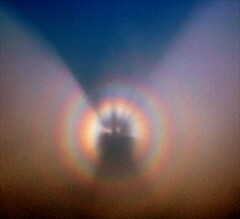 Your shadow, meanwhile, is likely to take on an eerie shape known as Brocken’s spectre. When net curtains, or umbrellas, are made with sufficiently thin and uniform fabric, it is quite common to see diffraction fringes around light sources. The shape of these is characteristic of a square diffraction grating, and closely analogous to some of the patterns seen in x-ray crystallography. If you get the chance to look through a drop of water at an unfocused point of light somewhere behind it – through a window or a pair of glasses, for example – you are likely to see a caustic projected on the back of your eyeball. Around the edges and cusps, where the light is bent back on itself, we can sometimes see quite rich and occasionally colourful interference fringes. 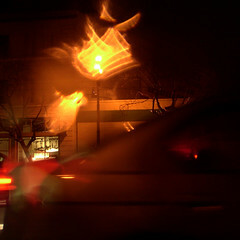 A different but related effect is sometimes seen through a fine mist of water on a glass pane, or an eye that is covered with the right kind of gunk. There is a hazy ring around light sources, and then the darker and lighter fringes that are characteristic of diffraction. Occasionally the same effect can be seen in a dusty mirror. When we look at a bright, featureless area, it is common to see what look like translucent objects floating across our fields of vision. These are the shadows of loose cells and other tiny pieces of debris passing close to our retinas, and they are often on the right scale to show noticeable diffraction fringes around their edges. 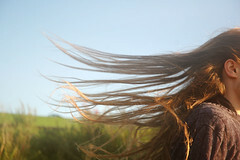 Once you know what to look out for, the wave nature of light is easy to see. All these little oddities in the behaviour of light make perfect sense when you know that light – just like water waves and sound waves – bends when it passes from one medium to another, spreads out around barriers, and shows areas of greater and lesser intensity where waves reinforce or cancel each other out. I’ve been a little slow to start going through my photos from this Summer’s two-month trip around the Iberian peninsula. I stayed for about two weeks in the town of Carballo, which is 35km from A Coruña, 45km from Santiago de Compostela and 10km from the nearest beach. It’s a small, quiet town full of empty buildings, half-finished or abandoned, slapped together with an obvious disregard for any kind of building code. 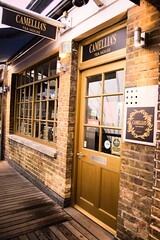 Most of the bars are mostly empty most of the time, and presumably they couldn’t stay open at all if they had to pay the kind of rent you have to pay for premises in places where people want to live. There is life and music if you know where to look, though, and it’s an easy enough journey to the beautiful beaches. A clear stream runs through Carballo, past the bus station. close to where I was staying, with fish and bats and dragonflies. It leads quickly out of the bricks and concrete, into the woods, like an artery. The air is fresh, and the hazelnuts you can pluck from the trees in late summer are like a taste of heaven. 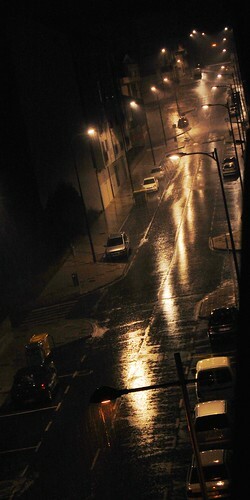 The last night I was there, I was woken by a mighty rainstorm battering against the thin roof of my attic flat. It’s the rain, above all, that makes Galicia so gorgeous, once you get outside of its depressed not-quite-seaside towns – the rain that feeds its lush forests and sustains its wide green fields. The countryside throughout northern Iberia is stunning; you might miss the sunshine, but it’s worth getting wet for.